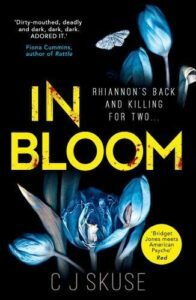 In Bloom by C.J.Skuse is a gripping contemporary psychological thriller that draws the reader in from the start. It is a sequel but I had not read the previous book and I followed the action just fine. The book follows a pregnant vigilante, very reminiscent of the Charles Bronson character in the 1970’s Death Wish films. The action alternates between the very ordinary and the extraordinary psychotic episodes. Written in the first person, the reader enters the killer’s mind. She is very personable and highly amusing. With contemporary cultural references the reader finds the lead character easy to identify with in some ways… but not others. Her lists of who should be on her death wish were rather amusing and could be seen as tongue in cheek for the reader… but not the character! I am not normally a lover of anything gruesome but In Bloom had me glued and entertained throughout.